When all the experts have been consulted, the risks have been assessed, the environmental studies have been carried out and the data has been compiled into workable maps of the exploration site, it’s time to send in the drilling crew. Before any drilling begins on land we may have to build access roads, construct a temporary power station or install wells for the water supply. In fragile habitats or very remote places helicopters or barges may be the only responsible way to get equipment and supplies into place. 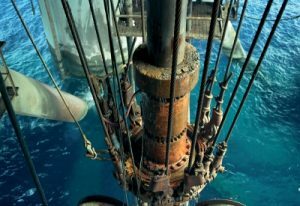 Drilling for oil in the winds, currents and choppy waters of the open seas is even more challenging. The most difficult part is getting a drilling rig to stay in position despite the currents and waves. In shallower water of up to 100 metres, we use what is called a jack-up unit. It starts out as a barge, which is towed into place. Legs extend to the sea floor and then the barge lifts out of the water, becoming a stable drilling platform. In rougher seas or water up to 300 metres deep we use some of the water itself as a counterweight. A semi-submersible drilling rig is a platform attached to submerged pontoons. When the pontoons are flooded with water they lower into the ocean, meaning waves don’t affect the platform nearly as much. In the most extreme deepwater situations we bring in the most heavyweight drilling option available, the drill ship. Drill ships are held in place by large anchors or by dynamic positioning systems, which use computer-controlled propellers to help the ship stay in place. Even at this stage, with crews and heavy machinery in place, there is a possibility that nothing will be found. Or the oil and gas discovered could be of such small quantities that extracting it would not be worthwhile. As the diamond or tungsten drill bit goes into the hard rock, a substance called ‘mud’ is pumped down through the pipe. This mud isn’t really mud. It’s a fluid consisting of water, clay, additives and thickeners. It both cools the drill bit, which can get really hot, and flushes out the shards of cut rock from the reservoir. As the mud comes back up through the outer part of the pipe, we get the first hard evidence showing whether we were right about the resources at the site. Geologists monitor the cuttings to check whether they’re coming out in the sequences they expected, while records of the mud and rock fragments are kept for further study later on. Once the exploratory well has been drilled, various instruments are lowered into it so we can learn more about the reservoir. This way we measure the natural radioactivity and electrical resistance of the rocks, as well as the pressure and temperature of the fluids or gases. Because crude oil and natural gas are hot and highly pressurized, we have to take great care to control pressure during the drilling process. Everyone involved in a drilling project undergoes rigorous safety training. Risks are assessed at every step. Increasingly we plan exploration projects remotely, using data instead of site visits, which means fewer employees and contractors are exposed to potential dangers on the actual rig. ← It may be time for you to change the way in which business schools work.